Christmas is about so much more than just Christmas day with all the presents and Santa coming. For me Christmas is an entire month-long season of good cheer and merry making. For those of us who fully embrace the season, December has set itself up to be the best self-help month there is. Think about it. When else are you going to allow yourself to cozy up in front of the tv with hot chocolate, a cozy blanket, and a feel good movie? When else are you going to bake all those indulgent treats and allow yourself some goodies? Another thing all this self care does for us throughout December is get us motivated for all those best intentions we have for the New Year. No other month is more refreshing, family-oriented, or full of good cozy food (in my humble opinion). 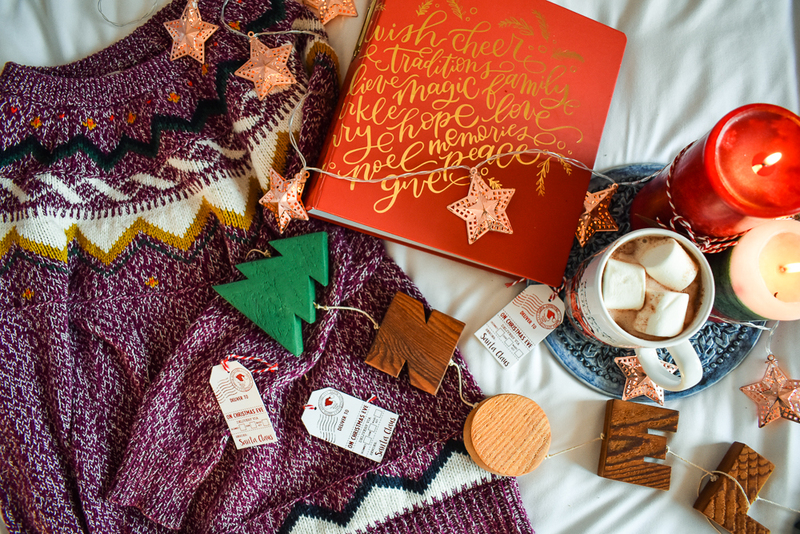 Here's a few of the things I love in December to keep that focus on the holiday season. I'm not talking about the popular 'ugly' Christmas sweaters and maybe a 'Christmas' themed sweater is just not for you, but there are so many seasonal sweaters out there. These are two that I wear throughout December. The purple fair isle sweater is from Old Navy last season. This is the one they are selling this year. 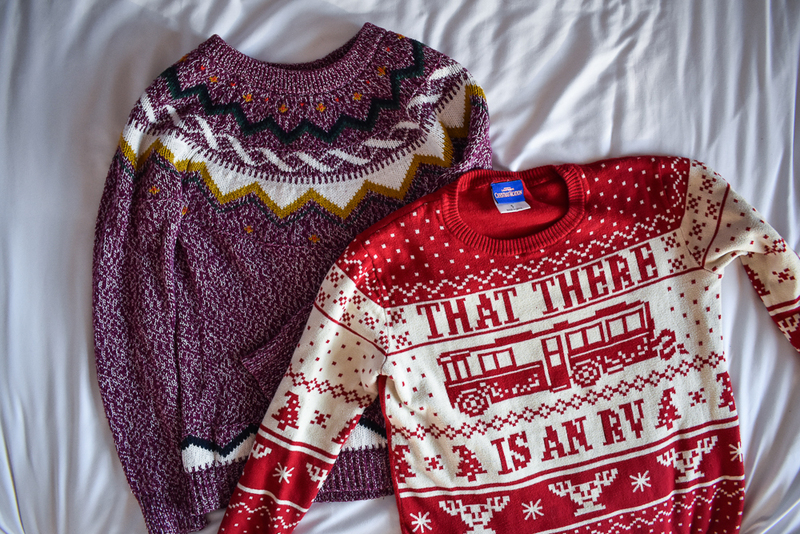 I love that winter look to their sweaters without being overly 'Christmas' themed. The red and white sweater is several seasons ago from Mod Cloth. There holiday sweater collection this year is serious business. I also love this one and this one. Hot chocolate just tastes way better when drank out of Christmas mugs that get tucked away each year with the Christmas decorations. It makes everything extra special since it doesn't hang out in the usual rotation of everyday mugs. 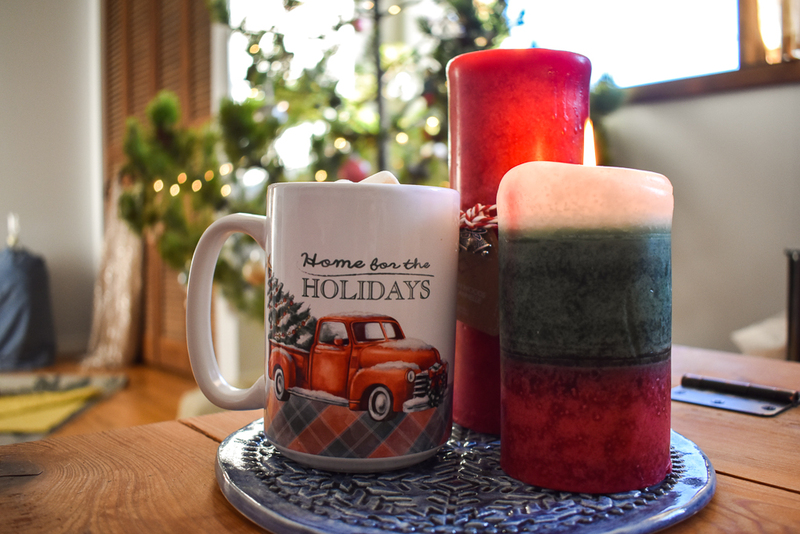 I've slowly been collecting Christmas mugs that I absolutely love. This mug was a gift from my mother last year. I also love this one and these are super cute if you want a set. I've also been slowly hunting down Christmas pottery. Not very common. This plate was done by a local potter and has an imprint of a snowflake on it. I'm also always hunting down Christmas serve ware. Like this cute tea pot. I actually have this tea pot, but in a skiing theme. Or these plates to go with the current garden gnome trend. 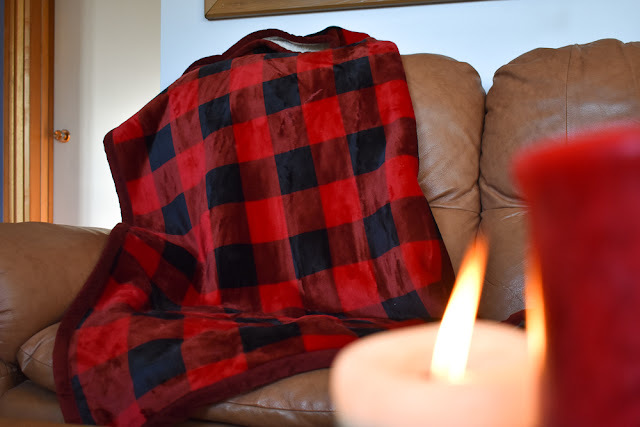 You can't go wrong with a cozy throw in your living room. Switching it out in December for something super warm and seasonal is a no brainer. This one was also a gift last Christmas, but here is one that is almost exactly the same. I also love this one or this one. 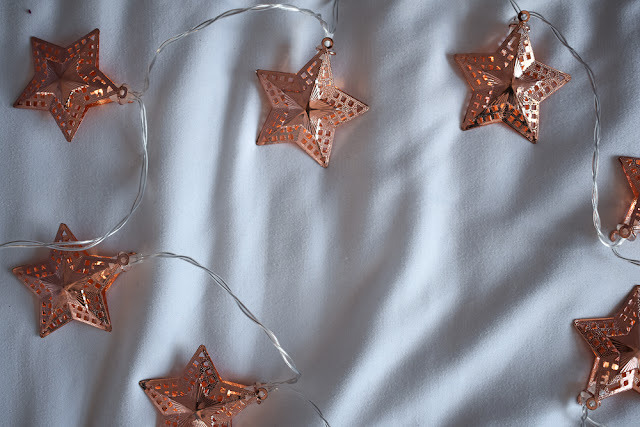 Both last season and this season I've been really loving different styles of twinkle lights. Usually twinkle lights like these come on short strands so I've been finding ways to hang them in the house. These right now are swagged along the top of a quilt that hangs in our kitchen. And they are short enough that they give that little pop of light that we all love at Christmas without covering your whole living room or kitchen in Christmas lights. Quality, not quantity right? I found these at Winners last year, but these ones are similar. These ones would be so great with Christmas cards!!! And the child in me loves these. Christmas pyjamas make those couple of hours after dinner and before bed into an event. Its just another self care December thing where, instead of flying around like an idiot after dinner trying to get things done, you instead slip into the bedroom and put on your Christmas pyjamas a) because they are more comfortable and b) because you know it creates every excuse for you to stop achieving for the day and sit with your Christmas mug and cozy blanket while you flip through the Netflix Christmas specials. The Christmas pyjamas are the biggest key in my opinion to the slower pace of the holiday season. The Merry Everything pyjamas are last season from Old Navy, but their current Christmas pyjamas are pretty great too. The striped set is from Marks Work Wearhouse. I have to say I'm pleasantly surprised because they are the highest quality and coziest pyjamas I own. 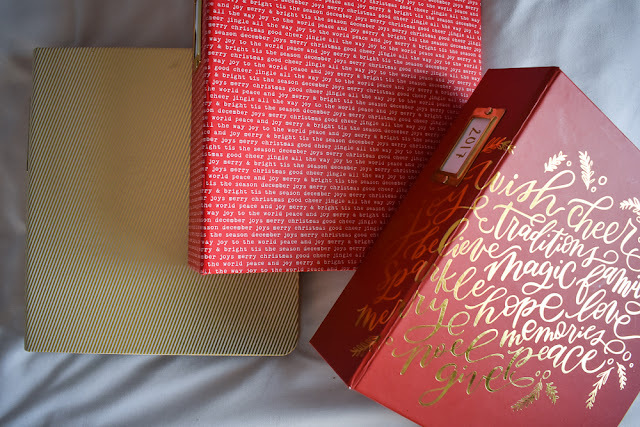 December Daily has easily been my favourite thing about December over the past 3 years. It's a scrapbooking project with the general idea being to document one photo for each day in December. The point is to document all the holiday memories and traditions that your family participates in. If I'm being honest my December albums are the only ones that are actually completed and I pull them out every Christmas as part of my decor. They sit on our coffee table and get flipped through by family and friends visiting. More importantly to me, they document that time in our lives. Where we were, what we were doing, what our family looked like, what we were interested in, etc. These albums also have some pretty big life changes documented in them which I'm sure we will cherish forever. This is totally a passion project for me and something I've been debating sharing on the blog here. So let me know if your interested in seeing my December Daily projects from previous years. 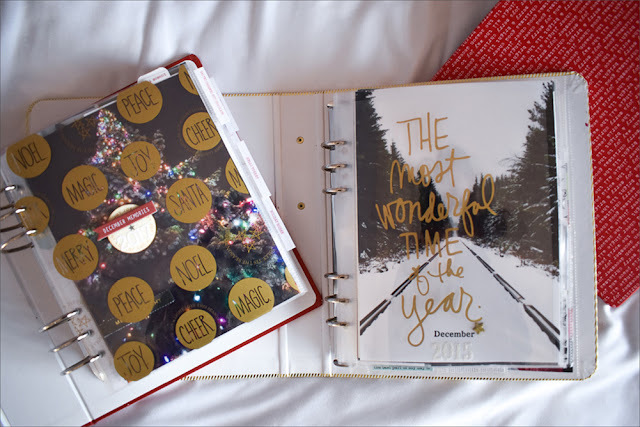 There are also some great youtubers out there that have videos of their December Daily process which is a huge help when trying to come up with 25-30 scrapbooked pages of seasonal memories each year. All the albums, and products to complete your album can be found here. Always love sharing and hearing what your favourites are at Christmas time. Always looking for new ideas or ways to make the season merry and bright, so let me know what your December looks like.